1. Preheat the oven to 180°C (160°C Fan, Gas Mark 4). Line a fairy cake tin with 12 Fun Baking Cases. 2. Make up the Egg White Powder as directed on the packet. Add the Cream of Tartar and whisk until stiff. Gradually whisk in the sugar to make a light and fluffy meringue. Add the Rose Flavour. 1. In batches, sift and gently fold the flour into the meringue until well combined, trying to keep the mixture as light and fluffy as possible. 2. Spoon the mixture into the Baking Cases to fill them and bake in the oven for 12-15 minutes until risen, lightly golden and springy to the touch. Transfer to a wire rack to cool completely. 3. Using a small spoon, scoop out a piece of sponge from the centre of each cake and fill with jam. Put the scooped out piece of cake back on the top. 4. 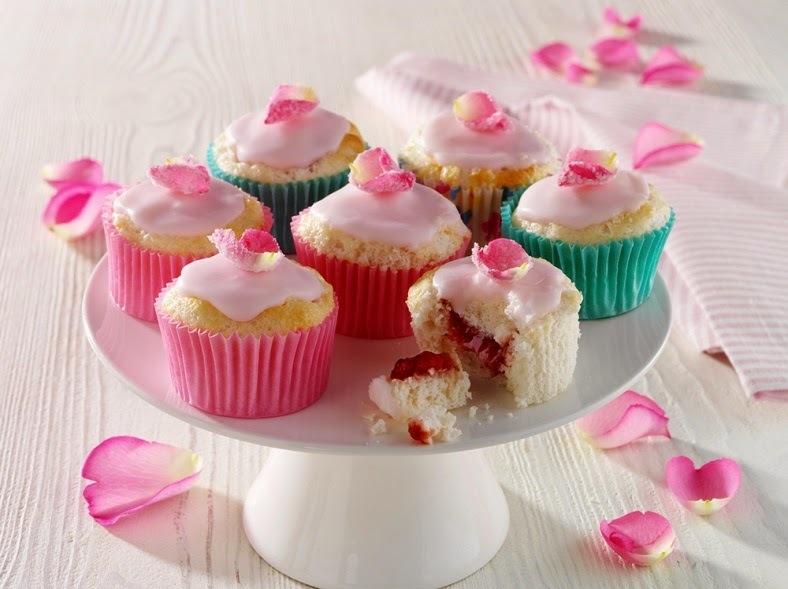 To frost the rose petals, make up 1 sachet Dr. Oetker Egg White Powder and lightly whisk. Using a paint brush, lightly brush individual fresh rose petals with the Egg White. Shake well to remove the excess Egg White then dip in caster sugar. Leave in a warm, dry place for a few minutes until the petals become dry and crusted in sugar. 5. 5. To decorate, sift the icing sugar into a bowl. Gradually mix in approx. 15ml (1 tbsp) warm water to make a smooth, spreadable icing. Mix in a few drops of Hot Pink Gel Food Colour to make a pretty pastel shade. 6. 6. Carefully spread a little icing over each cake. Allow to set for a few minutes before decorating with sugared rose petals. Your cakes are now ready to serve and enjoy.